Everyone wants to be industrious. It creates happiness, and gives our life purpose at every age. The 5th graders are at science camp this week, which leaves their school jobs vacant. Some of the fourth graders decided to ask the principal how they could help. She is so brilliant and I just love her. She found something for those who asked. Who knew she could create such excitement? You would have thought she told the kids they could go to Disneyland. Charlie came home yesterday and had something very important to ask me. He couldn’t wait for me to get off the phone with my sister, and kept interrupting me. Of course, I’m still trying to teach him patience and respect, and I (meanly) asked him to wait until I was done with my conversation. He obliged and as soon as I hung up he told me his plan. He had to be at school today by 8:05 am at the latest because he had an important job to do and he had to be on time for his training. 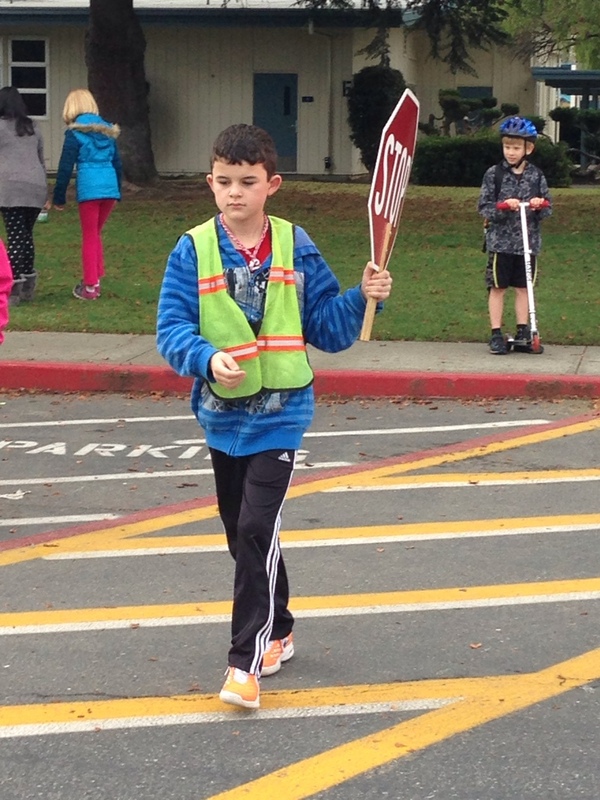 He was going to be the school crossing guard and he took his job very seriously. He was so excited and the energy that was coming out of his body was bouncing off the walls, “entertaining” us all. He insisted that we wake him up early and he was the one asking me if I was ready to go way before it was time this morning. I LOVED his enthusiasm. We were the first of the four students to arrive. He picked out his vest and sign and was ready to report for duty. This is a very serious job and there is a bit of a danger component that made it even more important. I was very proud of his work effort and how he focused on learning the new procedures and executed his role with confidence. I loved watching the kids work with the principal, and I loved being in the group of moms standing on the sidewalk observing and being proud. All the kids really were truly happy serving and being helpful. This made me realize how important it is for all of us to feel needed and purposeful. He can’t wait to go back to school early again tomorrow and serve again. And you will find happiness. Just like Charlie. I love this. Go Charlie! It is wonderful to see Charlie so excited-good job Charlie.